The other half of the couple at the center of Outlander is Sam Heughan who plays Jamie Fraser. I interviewed Sam with fellow journalists in a roundtable setting at San Diego Comic Con. The interview started before I was ready, and I happened to catch the tail end of a question or possibly just a friendly chat that involved a lot of red heads somewhere. I had to laugh at this, listening to the interview again which somehow segues from red heads to the brutal Wentworth Prison scenes that ended the episodes for the first season. Q: How did you get into the mindset of that Wentworth Prison scene? How did you take yourself there? Sam: Yeah, we knew it was coming up. I was excited by it. Nervous, but we knew it was going to be challenging. We wanted to go as…make it challenging for the actors as well as the audience. We kind of approached it basically like any other theatre piece. Myself and Tobias (Menzies) are both from a theatre background and we sat with the director and writer for about a week of rehearsals, discussed the scenes, sort of come down in range a bit…(interrupted briefly by publicist)…So we pretty much worked out what we wanted the audience to feel, to see…we pretty much set the guidelines and boundaries of doing the scene and then we filmed it over a space of about ten days, two weeks. It was pretty intense stuff, primarily because of the content but also because of a lot of prosthetic work, so I would be in at 4 AM and not finish until 10 or 9 on things, so they were long days, but in some ways that was perfect. It got me into that mindset of…I had three or four hours in the morning to sort of prep and stand there as people were painting stuff on your body. And then in the evening, taking it off was a good way to sort of lose the day’s filming. Yeah, it was heavy stuff, but we knew we were doing something quite bold and I was excited to see the end product. Outlander Podcast: Your character begins season two in a completely different place than where we begin in season one. What do you see as the challenges or benefits of this in approaching the new season? Sam: In a way, I suppose it is more of a challenge actually because the first season because Jamie’s got no responsibility. He is pretty much out looking after himself. He’s reacting to every moment and then suddenly…yeah, in season two, it’s completely different. We’ve got the hangover from the trauma of season one and the responsibility of having a wife, of being a father, becoming a parent, so yeah, he has had to grow up, and in season one, he certainly did. In season two, he is still coming to terms with the events of season one, but also he has gone to Paris which is not alien to him, but it’s certainly not a world he is particularly comfortable in and he is having to assume a new identity there as well. It certainly feels like a different person. Outlander TV News: There has been kind of an ever-changing cast. You and Caitriona (Balfe, who plays Claire) are going to be the only ones that are pretty much constant throughout however many seasons this runs. How is that for you as an actor to constantly have different actors and characters to interact with? Sam: It’s wonderful. We are in the French Court at the moment. Murtagh (Duncan Lacroix) is the other character that is with us and travelled with us. Duncan Lacroix, he is terrific. It’s just the three of us. We’ve got this cast of French actors who are amazing and bring a totally different energy to it and a different world. And I think the joy of this show is that it is always moving and constantly changing locations and storylines. Also, it is a little sad. We kind of miss the old school boys, but we know we are going back there. The second half of the season is very much going to be the antithesis of the first half. The first half is very ostentatious and luxurious and the costumes are amazing, and the second half is going to be more mud, blood, and battles. It’s nice to be in a different world, and I know this series does constantly travel and that’s going to be the journey. Jamie and Claire are going to develop, and the characters are going to develop. Q: What are Jamie and Claire trying to accomplish in the first half of the season? Sam: They are here to change history basically. The Battle of Culloden…(one of the journalist’s cell phone notification kept going off during the interview while she was recording audio)…you are very popular…The Battle of Culloden, they keep talking about it and in season one as well, it’s this big battle that happened between the British and the Highlanders. The Bonnie Prince Charlie believed he was the rightful king, and he probably was, a Stuart King, he came to rally the clans to put himself back on the throne and overthrow the Hanoverian Kings. It failed basically. This battle, they got wiped out, and then the repercussions were that the British army banned the whole Highland culture: the wearing of kilts, the speaking of Gaelic, the bagpipes. There were the Highland clearances where people were put on boats and so…they are there to change history and that’s pretty much it. Q: Can you talk a little bit about Claire and Jamie’s relationship and how it starts at the beginning of the new season. Sam: In season one, they were newlyweds. They were young lovers and they were finding out about each other and obviously they are still finding out about each other, but yeah, it has moved on with the trauma of the end of the season, it has affected the relationship a lot. Also, the fact that she is a parent, well, she is a mother, and he’s obviously got the responsibility of being a father so it’s…they are working it out together, but there’s a lot of issues they haven’t dealt with yet and we play that out in the season, but ultimately, you know the mission is the most important thing, changing history, and making sure everyone survives, but their relationship will never be the same again. Q: Talk about some of the new allies or foes for Jamie and Claire. Sam: Yes, well we have a lot of terrific actors that have come in. Dominique Pinon, Frances de la Tour, so it is really a powerful and amazing cast that is coming in and bringing in a new dimension to the show. But yeah, it becomes almost a different kind of battle with the politics that are played out. (The Compte) St. Germain, the extraordinarily good-looking actor Stanley Weber who is French and very interesting. I think he is going to do very well. It is a different kind of enemy they are facing, but mostly there are new relationships, new friendships. They build a…almost surrogate son that they get. This adopted son named Fergus (Romann Berrux) who brings a new dimension, dynamic to their relationship. It is all about moving their relationship forward. There are never any moments of peace really. Q: Now that Jamie is an expectant father, is that going to change his behavior at all or even his behavior towards Claire? Would he not take as many risks while they are in France? Sam: Yeah, I think, you know, before he met Claire, he would skin his back with no heed. He was more apt to put his body on the line, but now he has to think twice about that. And that is one of the lessons that he has learned in season one, and in season two, he is still the same guy and can still be hot-headed at times or stubborn, but he certainly has grown up a bit and knows he’s got a responsibility. At times, he does forget. Three if By Space: What does having been on such a Scottish…Scotland-celebrating show have done for your personal national identity and pride in your country? Sam: I think you put it there. I think I am very proud of Scotland. I’ve gone back to Scotland and kind of rediscovered my country. I have fallen in love with it again. I am very proud of all the production. It really shows off Scotland. I think the craftsmanship, the locations, the studios we’ve got now. We’ve got four sound stages, whole workshops. We’ve got one workshop where they are just building French furniture. We’ve got another where they are doing props. It really is magnificent. It is creating a lot of industry for Scotland. It’s attracting more productions, other TV shows and films as well. Yeah, I’ve been delighted that we have been given the opportunity…We were at this Edinburgh Film Festival and I got to meet the cultural minister for Scotland and it feels there we’re not a player in politics, but it has been realized that it is a great thing for Scotland and the U.K. as well. Outlander Podcast: How do you play a damaged character without playing the victim? 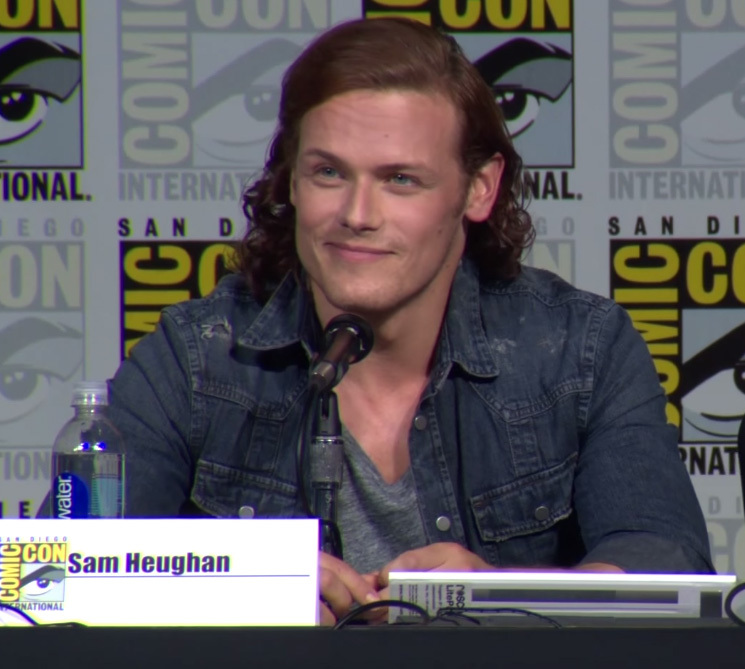 Sam: Jamie did get some resolution at the end of season one. I mean, he was not cured in any way, but he’s moving forward. I spoke at length to our on set doctor about the medical conditions and what happens in psychology as well, but ultimately I think everyone is different and deals with trauma in different ways. Jamie is very particular in the way he deals with things. Before, when we see he got whipped (earlier in season one), he kind of lets it float off his back, but this has certainly affected him. He is not a victim. He is moving forward. He’s got this mission. He’s there for a purpose and it’s not weighing him down and incapacitating him. He has things he’s got to deal with. We just finished filming the moment he finds some resolution and that’s kind of nice to see, something that brings him around to himself. I discussed that in a lot of cases people that did have some sort of trauma, it would be something random that would trigger that moment of healing and moving forward. I am very lucky to be able to play that part. It’s an interesting character to play.